2015 May Job Cut Report: Oil Cuts Ebb As Employers Cut 41,034 | Challenger, Gray & Christmas, Inc.
After reaching a three year high in April, planned job cuts announced by U.S.-based firms declined sharply in May, falling by 33 percent to 41,034, according the latest report released Thursday by global outplacement consultancy Challenger, Gray & Christmas, Inc. The latest tally on employer downsizing activity comes on the heels of the 61,582 planned job cuts announced in April. 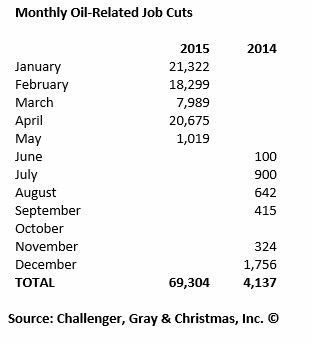 That was the highest monthly total since 61,887 layoffs were recorded in May 2012. 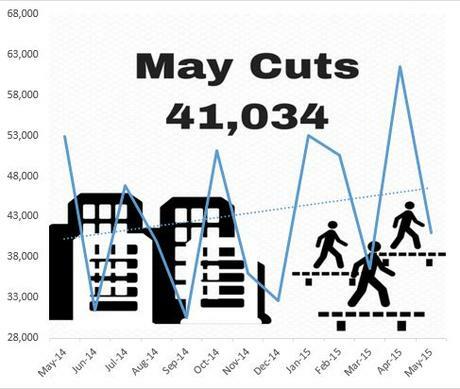 Last month’s total was 23 percent lower than a year ago, when 52,961 planned job cuts were announced in May. To date, employers have announced 242,830 in 2015. That is 13 percent more than the 214,600 job cuts announced in the first five months of 2014. Job cut announcements related to falling oil prices appear to be ebbing. In May, just over 1,000 planned layoffs were attributed to the drop in oil. In contrast, April saw 20,675 job cuts blamed on oil prices. “Oil prices are starting to stabilize. Exploration and extraction companies responded quickly to the drop in prices, but they are likely to be careful about cutting too deeply, as they will need workers on hand when demand inevitably increases. Unless, there is another severe drop in the price of oil, we probably will not see another surge in oil-related job cuts this year,” said John A. Challenger, chief executive officer of Challenger, Gray & Christmas. In May, the heaviest downsizing occurred in the financial sector, where announced job cuts will impact 5,539 workers. The bulk of these cuts came from banking giant JP Morgan Chase, which announced that the number of tellers working in its branches will shrink by 5,000 over the next 18 months. Overall, financial cuts total 14,853 in 2015, which is 28 percent fewer than the 20,581 job cuts announced in the sector during the first five months of 2014. The government was the second leading job-cut sector in May, having announced 5,539 layoffs during the month. Most of these originated from one employer; the state of Massachusetts, which announced plans to trim its payroll by 4,500 workers in an effort to close a $1.8 billion budget gap. “A lot of states were undoubtedly hoping that economic recovery would solve their budget woes, most of which can be traced back to overwhelmed pension systems. For most states, these dreams have failed to materialize. At least 16 states, including Massachusetts, Maryland, Illinois, Wisconsin, and Washington are expected to experience budget shortfalls over the next year or two,” said Challenger.